All functionalities of AppsFramework are more improved, integrating with CAPH. Therefore Appsframework is not supported since 2015 Smart TV. To comply with the Federal Communications Commission’s (FCC) closed caption rule, Content Providers (CPs) must support closed captions for video. In particular, applications bundled with a device are considered to be part of the device, and are covered by more stringent rules pertaining to devices (Section 203 of the CVAA). For these bundled applications, CP must use either their own solution or manufacturer’s solution for captioning. This solution must handle complicated closed caption user attributes as listed in the FCC rules. The definition of these attributes draws from the CEA 708 standard. If you want to use Samsung’s solution, we support CEA-708, SMPTE-TT and SAMI formats. Case 1: CEA-708 - see Using CEA-708. Case 2: SMPTE-TT / SAMI - see Using SMPTE-TT or SAMI. Case 3: own solution - see Using own Closed Captions Solution. If content contains CEA-708 captions, nothing has to be modified. 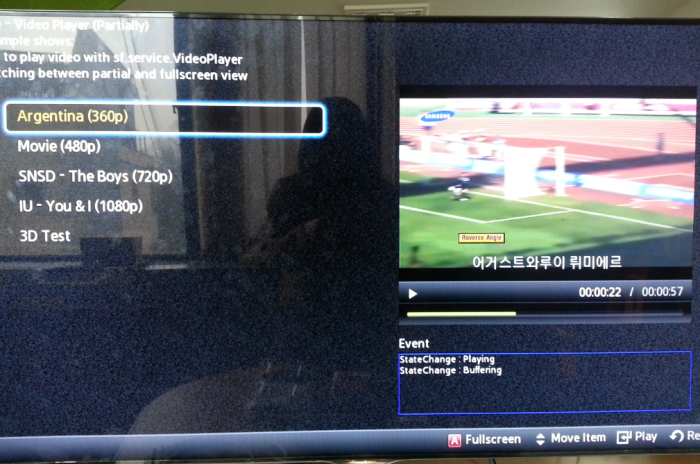 The Samsung platform will parse CEA-708 data and render it based on the user’s closed caption attributes settings. The Samsung native UI supports user’s closed caption attributes settings. Player API namespace sf.service.VideoPlayer enables application to play video with Samsung’s standard UI. To play video with subtitles, you should additionally pass the “subtitle” option. type: "sami",                             // Subtitles type. "sami" or "smpte-tt"
Currently, Player API supports two subtitles types, “sami” and “smpte-tt”. If the subtitles type needs a separate data file, pass the file’s URL as subtitles url option. The video will be played with requested subtitles. In case of “sami” type subtitles, the sf.serviceVideoPlayer provides “SMI Setting” menu to end users. Users are allowed to change the subtitles language if this operation is supported by the “sami” data. Additionally, subtitles’ synchronization time can be increased or decreased by the user. There is also a “General” OSD menu level which contains the general subtitles options. Details of getClosedCaptionOption and its parameters are listed in the table below. Gets the value of specified closed caption parameter. Parameter index Refer to table below. property Refer to table below. Return If call is successful, returns currently set parameter value for the closed caption parameter. -1 in case of failure. Details of requestDownload and its parameters are below. Request to start download using http or https. This function is asynchronous, result status will be delivered to widget as an event. Parameter Url Source url to download from (URL can start with http or https). OnEvent Callback function for download status. It receives file path as an argument. If call is successful, returns 0. -1 in case of failure. On application exit, the caption file must be deleted. For this, you can use the removeFile function. Its details can be found below. Removes a file from device. Parameter FileName Name of file to be deleted. AVPlay object from Media API lets you use an external SMPTE-TT or SMI file for subtitles. The subtitles callback, onsubtitle(), is called when a single subtitles string should be displayed on the screen. This callback has 3 parameters: sync time, subtitles text string and subtitles text string properties. The first and second parameters are intuitve. The third parameter supports three possible string values representing respectively: character color, background color and caption window color. The parameters are concatenated with the position of subtitle part that the property should be applied to. From first character to nineth character, the subtitles character color and background color are black and caption window color is red. From tenth character to the last character, the subtitles character color and background color are black and caption window is transparent. Please refer to the table below for color values. The CP must fully comply with all FCC’s requirements relating to the user attributes of closed captions. Refer the original text of the regulations (IP Captioning Order, Jan 12, 2012 (FCC-12-9A1)). is displayed as it arrives (paint-on). blue, yellow, magenta, and cyan. between opaque and semi-transparent opacities. as the default font for each of the eight styles contained in § 79.102(k). between opaque, semi-transparent, and transparent background opacities. depressed edges, uniform edges, and drop shadowed edges. available and identify such a caption track as "easy reader". Engineers Timed Text format (SMPTE ST 2052-1:2010: "Timed Text Format (SMPTE-TT)"
subpart (c) of this section. 1.You can download the example video application here. Figure 1. Screenshot of video play application using the caption options. 2.You can download the example application here. Pressing the direction keys on the remote will result in changing and displaying closed captions options. Figure 2. 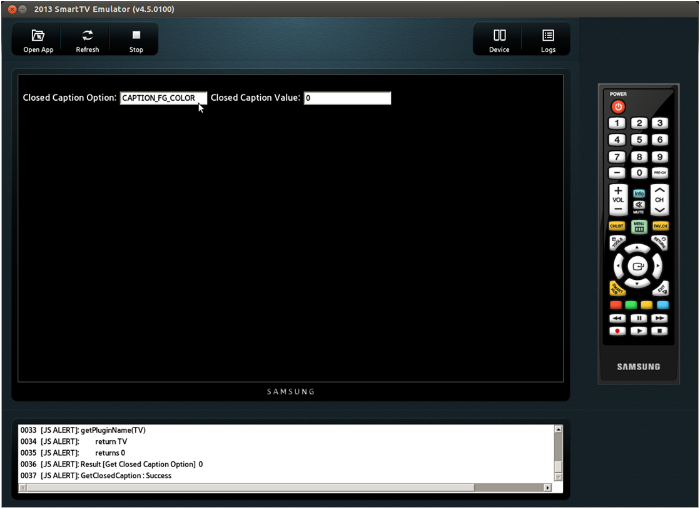 Screenshot of initialized example application showing one of the closed caption options. (1, 2, 3) Minimum 8 colors: white, black, red, green, blue, yellow, magenta and cyan.